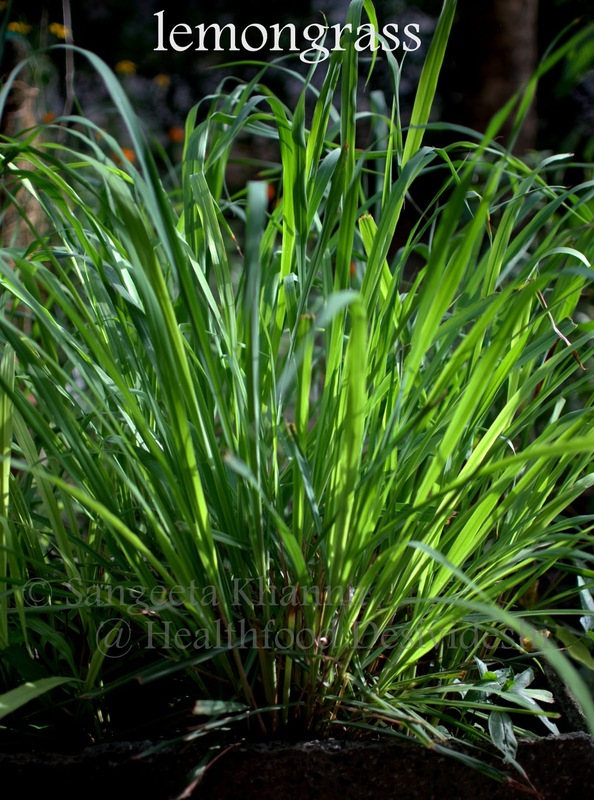 Lemongrass (Cymbopogon citratus) is a nerve soothing herb, the essential oil in this herb has a lemon scented compound called Citral which is a potent cancer fighter. Read here how it is a research proven fact. It is a pain reliever, helps in relieving digestive tract spasms, muscular pains and even joint pains related to rheumatism. It also reduces fever and inflammation, very useful herb to treat seasonal cough and cold. Lemongrass is also found to regularize menstrual flow in cases of amenorrhea as it generally improves blood circulation as well. Imagine something so useful and so tasty and aromatic. 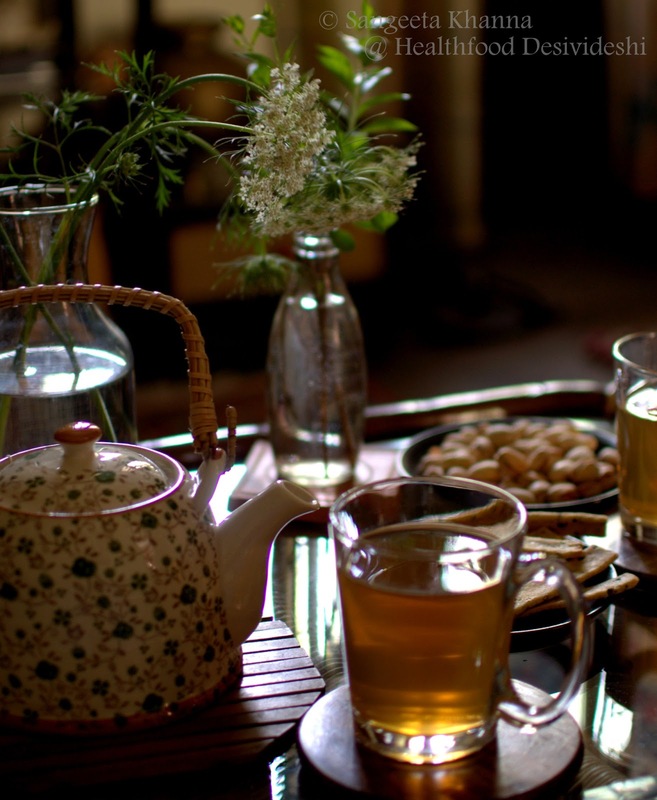 The curries and teas can actually heal us if used strategically. 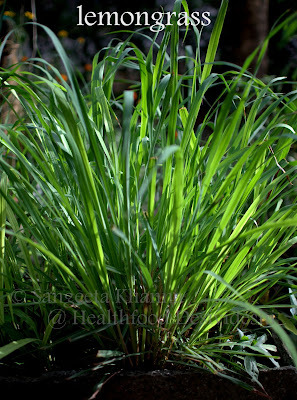 Lemongrass is anti inflammatory, antioxidant and astringent. The good thing is, it can be grown easily in a clay pot if you get good sun in your balcony or have a sunny patch anywhere. Good sun, good drainage and frequent watering is all this grass needs. Back to the tea, just heat a liter of water (yes it's all for myself), and take a large blade of lemongrass, twist it and tie into a small knot or just scissor cut in small bits and put into the water when it is just about to boil. Take off heat and cover for 3-4 minutes. Grate half an inch blob of fresh root ginger, and put it in the tea strainer along with 2 tsp of loose green tea or a tea bag. I prefer to tie a knot of the lemongrass blade and put that into the kettle. Now everything is in the kettle, pour hot water over it, cover and let it brew for 4-6 minutes. Serve as and when you wish. I keep sipping on this tea even when it turns cold. I love it without a sweetener but you can add a hint of honey to it. This is also a great tea for those who want to start on green tea but green tea feels awful to them. These refreshing flavors would make you want to have more of it. Serve it with some savories if you are serving it to friends. I was clicking these pictures for an online photography workshop by a wonderful food photography blogger Neel at Lfp. I am learning lots at this workshop and feel enthusiastic about taking pictures most of the times now. Hopefully you will be seeing better pictures on this space in future.. Stunning pictures Sangeeta; love the way these look! WOW!! First time on your blog and love it. Already a fan on your facebook page. Amazing shots! I'm a huge fan of your blog.. I just had some confusion regarding the instructions you have given here.. Do you boil the lemongrass in a litre of water and then cover for 3-4 minutes, and then add everything to the kettle again? 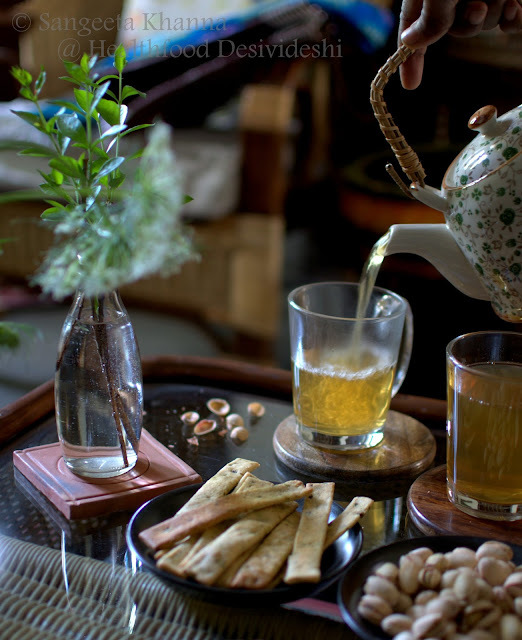 Hi Sangeetha, I love herbal teas! thanks for sharing the recipe and info on benefits of it. The pictures u posted here are so amazing! loved it!